Diabetes is a chronic disease primarily affecting small blood vessels throughout the body. In the eye, it leads to decompensation of blood vessels, breakdown of the blood-retina barrier, and, as a result of this chronic insult to the blood vessels, oxidative stress. Oxidative stress initiates a host of downstream effects, ranging from VEGF-mediated vascular permeability and angiogenesis to inflammation and apoptosis (Figure 1). Figure 1. Oxidative stress pathways implicated in DR and DME include increased vascular permeability, angiogenesis, inflammation, and neurodegeneration or apoptosis. • Agents that should be agnostic to VEGF-mediated pathways could be used as independent or complementary agents in the treatment of DR and DME. Anti-integrin therapy is a promising example of this approach. • The anti-integrin molecule risuteganib met primary and secondary endpoints of noninferiority in BCVA gains and improvement in central macular thickness compared with bevacizumab in a phase 2 trial. • A phase 3 trial to further evaluate this treatment approach is expected to begin in the first half of 2019. Clinically, we see the results of these effects as the sequelae of diabetic retinopathy (DR): leakage, diabetic macular edema (DME), neovascularization, hemorrhage, and tractional retinal detachment. Available treatments address only a few elements of this complex process and do so fairly far downstream. Intravitreally injected anti-VEGF drugs have strong antipermeability and antiangiogenic effects, but not all patients respond to anti-VEGF monotherapy. In fact, nonresponders, poor responders, and plateaued patients make up at least 50% of our patient population.1 Outside of ophthalmology, anti-VEGF therapy is rarely used as monotherapy. Its role in oncology, for example, is to help vessels mature so that radiation, immunotherapy, or other agents can be effective. Our assumption is that, in patients who have a significant amount of inflammation and other oxidative stress processes involved, inhibiting VEGF alone may not be sufficient. We may need to target additional downstream pathways and/or address oxidative stress further upstream. Ideally, we want to prevent retinopathy much earlier and reduce the occurrence of DME. There are four general approaches being taken in attempt to bring new drugs for DR and DME to the ophthalmic market. These include brolucizumab (RTH258, Novartis) and abicipar pegol, a designated ankyrin repeat protein, or DARPin, in development by Allergan. Recently, therapies for DR have received considerable attention, and perhaps most intriguing in this area is the Tie-2 activator AKB-9778 (Aerpio), which is given subcutaneously. There are several making their way through human trials. The most advanced may be RG7716 (Roche/Genentech), a single-molecule, bispecific agent that inhibits both VEGF and angiopoetin-2, or Ang-2. These drugs could be used as independent or complementary agents, and the most promising approach among them may be anti-integrin therapy. Integrins have functional and structural roles in cell biology. Integrin receptors are upregulated when a cell is under stress, and they play a role in signaling all the downstream effects of oxidative stress. Blocking these receptors could therefore be influential in mitigating the effects of oxidative stress. Think of integrins as a thermostat. If room temperature is too hot, thermostat sensors register that condition and send a signal to the air conditioning (AC) unit to turn on. Although anti-VEGF agents are effective at turning the AC unit on or off, they don’t have an impact on the room temperature sensors. If those are faulty, they will keep telling the AC unit to turn on again and again. At least two integrin inhibitors are in development for retinal disease: SF0166, a topical anti-integrin agent being explored by SciFluor Life Sciences, and risuteganib (Luminate, Allegro Ophthalmics). Two phase 1/2 clinical trials of SF0166, a small molecule that selectively blocks the alpha-V beta-3 receptor, have been completed, including one in patients with DME. In that trial, 40 patients with DME were randomly assigned to receive one of two dose strengths (2.5% or 5%) of SF0166. Patients administered the agent themselves as an eye drop twice daily for 28 days. The trial’s safety endpoint was achieved, with no drug-related serious adverse events. Ocular adverse events were noted in the treated eyes of six patients. All ocular adverse events were mild, and one was considered to be possibly drug-related. 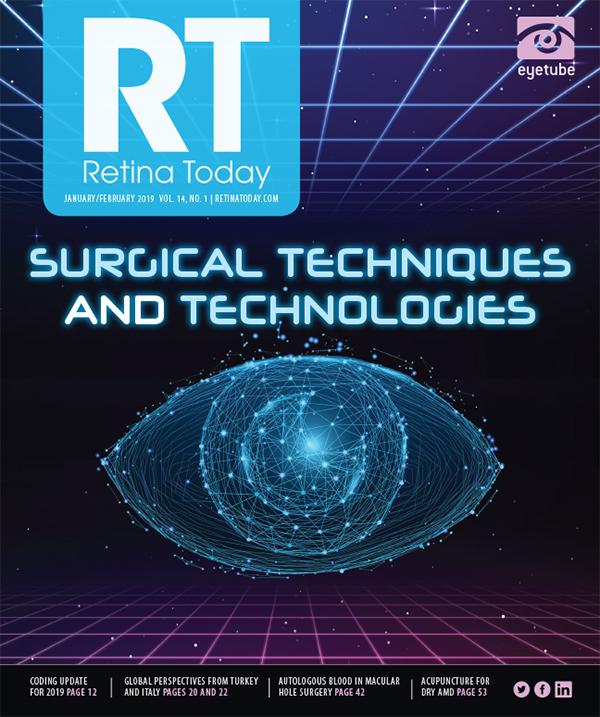 Additionally, SF0166 demonstrated biological activity in both dosage groups, with 53% of patients demonstrating a reduction in retinal thickness and improvements in VA.4 Durability of retinal thickness response after the 28-day course of therapy was observed during the month of follow-up without treatment. The potential of risuteganib anti-integrin therapy is that it blocks multiple integrin receptors, which is more like shutting off the signals to the AC unit. Additionally, using the earlier analogy, if the room temperature is already fine, then the integrin thermostat doesn’t send any signal. By shutting off the signal upstream, risuteganib has the potential to broadly downregulate all four pathways of downstream oxidative stress. In the DEL MAR phase 2 monotherapy study of intravitreal risuteganib, the study drug met its primary and secondary endpoints of noninferiority in BCVA gains and improvement in central macular thickness compared with bevacizumab (Avastin, Genentech). Stage 2 of the DEL MAR study then evaluated sequential therapy, in which patients were given an injection of bevacizumab at week 0 to clear the VEGF, then three monthly injections of risuteganib; and combination therapy, in which both drugs were dosed together at weeks 1, 4, and 8. The sequential therapy regimen was equivalent to bevacizumab, with fewer total injections and with 12-week durability after the last dose of risuteganib (Figure 2). Combination therapy, however, was inferior to sequential therapy and to bevacizumab alone. Additional research to better understand these effects is under way. Figure 2. In a phase 2 trial, sequential therapy with bevacizumab and risuteganib outperformed combination therapy and was similar to anti-VEGF therapy alone, with fewer injections. When Allegro stratified the results from the DEL MAR trials by prior therapy, they found that more robust improvements were observed in patients who had been poor responders to anti-VEGF therapy before receiving risuteganib, and the least robust improvements were seen in those who were treatment-naïve. That is consistent, in my opinion, with the theory that some groups of patients respond better to anti-VEGF therapy because their disease is heavily VEGF-mediated, whereas others have inflammatory or neurodegenerative processes that are not so responsive to anti-VEGF therapy. Phase 3 trials for intravitreal risuteganib are anticipated to begin in the first half of 2019. Preclinical studies of risuteganib demonstrated that the drug localizes in the retinal pigment epithelium (RPE) and outer retina and persists there for several months. This reservoir effect in the RPE may account for the greater durability of effect of risuteganib compared with anti-VEGF therapy seen in clinical trials thus far. Although animal models and laboratory research can provide a solid scientific rationale for understanding anti-integrin therapy, the real proof will be in the results of human clinical studies. Results from these studies will help clinicians understand whether and how anti-integrin therapy may fit into our treatment regimens for DR and DME. 1. Dugel PU, Layton A, Varma R. Diabetic macular edema diagnosis and treatment in the real world: an analysis of Medicare claims data (2008 to 2010). Ophthalmic Surg Lasers Imaging Retina. 2016;47(3):258-267. 2. Gonzalez VH, Campbell J, Holekamp NM, et al. Early and long-term responses to anti-vascular endothelial growth factor therapy in diabetic macular edema: analysis of Protocol I data. Am J Ophthalmol. 2016;172:72-79. 3. Dugel PU, Campbell JH, Kiss S, et al. Association between early anatomic response to anti-vascular endothelial growth factor therapy and long-term outcome in diabetic macular edema: an independent analysis of Protocol I study data [published online ahead of print February 22, 2018]. Retina. 4. SciFluor announces positive results of phase 1/2 study of SF0166 topical ophthalmic solution in diabetic macular edema patients [press release]. SciFluor Life Sciences. September 28, 2017. scifluor.com/media-center/docs/SciFluor_SF0166-Phase-I_II%20DME-results-9-27-2017-Final.pdf. Accessed August 10, 2018. 5. Quiroz-Mercado H. Randomized, prospective, double-masked, controlled phase 2b trial to evaluate the safety and efficacy of ALG-1001 (Luminate) in diabetic macular edema. Paper presented at: Association for Research and Vision in Ophthalmology Annual Meeting; April 29-May 3, 2018; Honolulu, HI. 6. Kenney CM, Chwa M, Cáceres-del-Carpio J, et al. Effects of anti-VEGF and ALG-1001 on human retinal cells in vitro. Paper presented at: Association for Research and Vision in Ophthalmology Annual Meeting; April 29-May 3, 2018; Honolulu, HI.